a bowl of exceptional quality and beauty is found, which is then given special attention to nurture a Prestige pipe. The Dunhill “White Spot” was the first pipe to carry a guarantee. That little white spot is still a symbol of perfection and style, and the guarantee still holds. 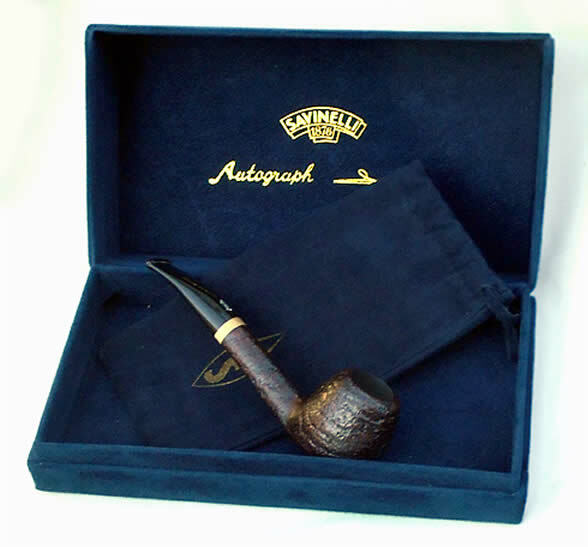 Dunhill pipes have an exceptionally long life and are in great demand as refurbished “estate” pipes. Why this pipe didn’t make a Straight grain rating surprises me. Straight grain around the bowl and Flame grain along the shank, with Birdseye on the underside and rim. Classic proportions for this very formal Military style shape. These pictures are of specific pipes we are holding for you. The pipe you see is the pipe you will receive. 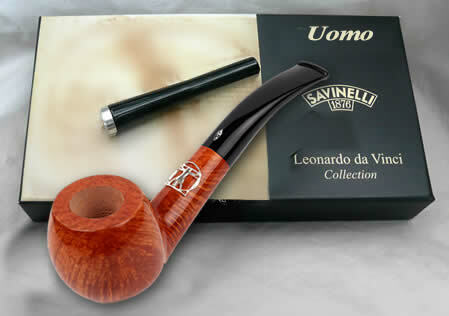 Each pipe is fitted with an acrylic or Lucite mouthpiece and can take an optional filter (Savinelli 6mm, Stanwell 9mm). In fact we have the best selection of Prestige Pipes in South Africa. You can make arrangements to see some at your nearest Wesley’s. More pipes of the same quality are available – just ask your nearest Wesley’s. Click the ' DETAIL' button for a closer look and a guide to the size of these unique pipes. The top of the bowl shows beautiful flame grain, with matching birdseye on the underside and shank. to the appearance of the bowl. 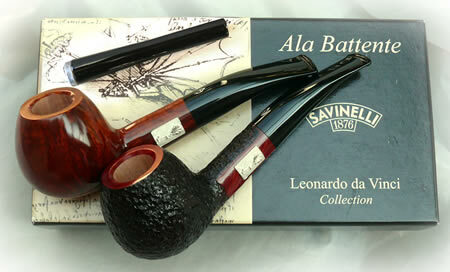 The individually selected freehand pipes are very beautiful, very smokeable, and not over-the-top in price. Erik Nørding started making his Freehand pipes in the 1960s. He only uses plateau wood for the Freehand Pipes. It is the outer part of the briar block where you find the most beautiful texture and grains. When carving a freehand pipe he tries as much as possible to follow the grain, making creative choices when he as to deal with natural defects within the wood. Although Erik is very innovative, he certainly doesn’t cut corners with the curing and drying processes. The finished pipes are large, and the wood is thick – but the diameter of the tobacco cavity is the standard 20mm. His freehand pipes are very beautiful, very smokeable, and not over-the-top in price. Harmony is a perfect description of these quality briar Nording pipes, with elegant multi-tone coloured finishes. This time we chose three pipes. Only one of each – the pipe you see is the pipe you will get. Each pipe comes with a lovely drawstring bag, to protect your pipe when you carry it. They feel very good in the hand, and Erik Nording has made certain that the briar is top quality, the finish is durable, and the smoking experience excellent. We only buy when we can select the pipes ourselves. This is our second shipment – the first fulfilled all expectations. New this year, we couldn’t resist these autographed pipes. But the pickings were thin and we had to settle for only two Smooth Natural pipes, and two Black Grain. Four distinctive pipes - the pipe you see is the pipe you’ll get. Each pipe comes with a lovely drawstring bag, to protect your pipe when you carry it. creating an overall dramatic smokey look to each pipe. We expect the Nording Signature pipes to offer the same excellent smoking qualities experienced with the previous shipment of Nording Harmony pipes. The “classic” pipe that made the name “Savinelli” famous all over the world thanks to the high quality briar and to the ultimate care in production. The quality is reflected in the mirror-smooth inside of the bowl, the predominance of hard wood, the hand-cut mouthpiece – and the light weight, which indicates the high calibre of the curing. All have a Teflon peg with a 6mm filter option; the pipes are presented with an adapter and 6mm balsa filters. The Gold Dot is the stamp of excellence on these magnificent pipes. Nobody makes a more consistent classic bent pipe than Savinelli. The two below are the larger kingsize shape 606 – a comfortable handful for a serious smoke. The grain in this pipe is straight across the top and base of the bowl, and over / under the shank. It forms a wide area of birdseye over most of the bowl – a joy to behold. Something different for your collection: But such designs and finishes are not for lower-priced briar – they need top quality wood, innovative designs, eye-catching finishes …….. and inspiration. 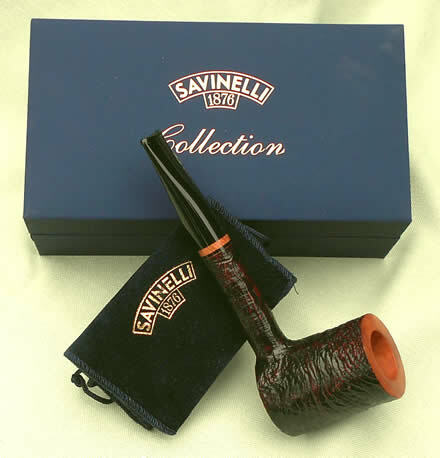 Achille Savinelli, a man who changed the history of the pipe, was born in Milan in 1918. To Achille, the son of the founder of Savinelli, pipes were a true passion. His original designs proved revolutionary, combining beauty and smoking satisfaction, producing pipes that he too loved and smoked every day. He possessed pipes of every shape and size imaginable. We are fortunate to be able to offer personally selected, top quality Savinelli pipes - each one made to the highest standards, a true credit to this renowned company. The mirror smooth inside of the bowl is an indication of the care taken in producing these fine pipes. They are all fitted with a black acrylic mouthpiece, very resistant to oxidation; and offer the option of a 6mm balsa “filter”. Each year a unique model is designed by one of the top pipemakers in the Savinelli factory and produced from well-cured, flawless briar in limited quantities according to the number of fine quality bowls available in the special shape and size. 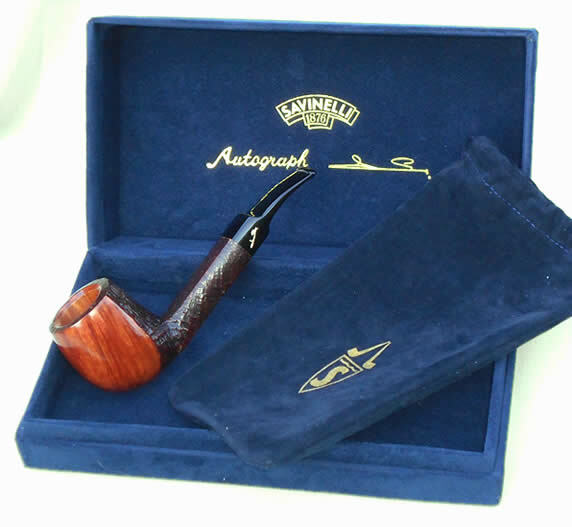 The pipe is authenticated by the inlaid plaque and the signature of Achille Savinelli on the mouthpiece, and accompanied by a numbered certificate of provenance. These pipes appeal especially to the Collector - but the distinctive styling and their smoking qualities make them universally appreciated. The shape was chosen in accordance with the grain of the briar ebauchon – a limited number selected for this series. The shape suits the flared grain perfectly – making the best of the natural briar. Flawless naturally – a real tribute to the art of the designer and quality of the briar. The link between shank and mouthpiece being part of the mouthpiece is the final touch. A brilliant example of skill and artistry - varying the depth of sandblasting from light through to medium-deep according to the grain of the bowl; the smooth rim is echoed in the briar link between the shank and the mouthpiece. The mirror-smooth inside of the bowl shows the tight straight grain, confirmed by the birdseye pattern on the rim. The small polished panel on the underside of the bowl allows the pipe to balance on its own – clever and convenient. Completely handmade, unique and unrepeatable - bearing the signature of Achille Savinelli. These exclusive pipes, which all Collectors covet, are carved by only a few skilled workers from the finest briar blocks personally selected by Giancarlo Savinelli, great grandson of the Founder, who currently heads the company. This rare, unique and irreplaceable pipe, is shaped from the raw material following the grain and the “fiammatura” (“flame”), which Mother Nature has put at our disposal, according to the artistic mood of our master craftsmen. The wood is natural and the shape is unique for each piece. The name “Autograph” was created from the handwritten signature of Achille Savinelli Senior printed on the mouthpiece. These pipes are created according to the characteristics of the raw material: the briar, and as a consequence their shapes are affected by the necessity and the creativeness. Practically they are all unique. I just had to buy this one – Flame grain from the base of the bowl to the rim, and to the end of the shank. The hollows on the hand-cut mouthpiece echo the line of the grain. Flawless, close grain; just enough softer wood to create a grain of real beauty. Naturally the inside of the bowl shows the same beauty, and the birdseye grain on the top of the bowl, is repeated on the underside and top of the shank. Generous size bowl, you can enjoy each pipeful for a comfortable length of time. When a grain is so beautiful, it is just asking to be displayed by a smooth finish. But that is not enough – the matching birdseye is highlighted by sandblasting, and right where you can appreciate it best. Now for evidence of the technical ability of the sandblaster – the clean straight line between the two finishes. Only the best craftsmen are allowed to work on such pipes. Now hold the pipe slightly sideways and see how the smooth inside of the bowl mirrors the grain of the outside. The pipe stands alone – a bonus. Did you ever see anything so stylish? The semi-square, rounded top, shank just flows into the hand-cut mouthpiece, with a hollow on each side following the line of the shank. The grain too contributes: beautifully flared; you can confirm by looking at the inside of the bowl. And it is so light – a real tribute to the quality of the briar and the curing. Now here’s an unusual shape – but how practical. Fingers fit snugly around the ridge which is cleverly shaped to fit either hand. The shaping allows the bowl to lie comfortably at a slight angle on either side. The inside of the bowl tells you that it is straight all the way up, and tight with it. The sandblasted outside of the bowl displays this grain so beautifully, a joy just to look at. The appearance – the smooth rim; the smooth-ended, gently curved shank which is echoed by the shape of the mouthpiece. The shape – the thick-wooded, solid bowl which it just nestles in the hand. The really interesting grain displayed by brilliant sandblasting. The entire bowl and the shank display an incredibly tight straight grain. Naturally, the mirror-smooth inside of the bowl shows the same tight straight grain, confirmed by the birdseye pattern on the rim. The shank is cut at an angle to match the grain on each side of the pipe. And here’s something new – the inside rim of the bowl is bevelled for more comfortable packing and lighting. “Briar Line” is a new series of ‘free hand’ pipes, shaped by hand, with a superior quality of briar, like the Autograph. The shapes are modern and attractive, and a little bit smaller compared to the traditional Autograph; they are decorated with a ring made of maple wood on the mouthpiece. On the stem of the bowl is printed the signature of Giancarlo Savinelli. On the mouthpiece is a new silver Savinelli logo. Just enough stain for you to appreciate the fine grains. A lovely flame grain on two sides of the bowl, with birdseye front and back. The shank has been specially carved to make the most of the grain. Not wanting to break the line of the shank and mouthpiece, the mouthpiece is tapered on the top. But saddle underneath so that the lip is thinner for extra comfort in the mouth. What an elegant shape, and good for the hand too. at the base of the bowl. The saddle is set at a diagonal which contributes to the elegance of the hand cut mouthpiece. This is when you appreciate the artistry – this briar ebauchon just couldn’t have been formed into any other shape. The straight grain all around the bowl just flows. Even the inside of the bowl is perfect. And the shank has been specially carved to make the most of the grain. The thicker rim at the top of the bowl highlights the excellence of the corresponding birdseye grain. 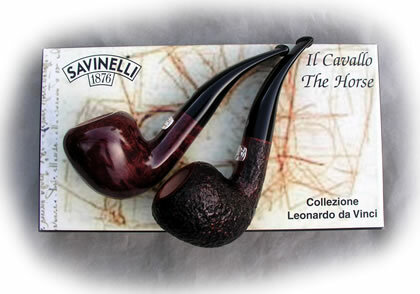 Typical of Savinelli touch is the almost triangular stem – with a perfectly distinct edge. The final polishing develops a rich burgundy glint to the peaks of the deeply sandblasted finish. A beautiful grain all over the delicately shaped bowl which curves gracefully into the rim. Typical of the Savinelli touch is the almost triangular stem – with a perfectly distinct edge even on the sandblasted finish. In this case the edge is set low on the shank, creating a flat base, and a smooth flow from the base of the bowl into the mouthpiece. The geometrically structured parallel-sided bowl is perfectly matched by the squared shank and flat base. And with all that – the overall impression is one of restrained elegance, and excellent balance. Feels great in the hand. The pipe stands on its own – very useful if you ever feel that you have to put it down. The Savinelli interpretation of a classic English Lovat – what a success. The burly bowl is matched perfectly by the shank and mouthpiece. While the curve of the mouthpiece gives it style. But wait – the shank is not just an ordinary round: the base forms 3 flat * sides of a hexagon, while the top is tastefully rounded to meld into the mouthpiece. *So it stands of course. Finally the grain – the inside of the bowl shows a tight straight grain, confirmed by the birdseye on the polished rim. 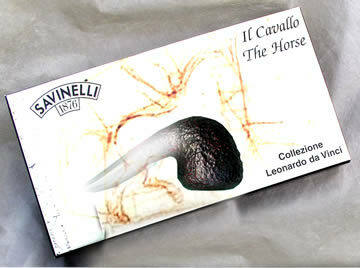 Savinelli wanted to celebrate this world famous person with a series dedicated to him. They began in 2007 with his most famous portrait "Mona Lisa". In subsequent years Savinelli featured others of his works which have inspired over the centuries objects that are now part of our daily lives. We have ”bumped into” the works of the great man on several occasions over the last 20 years: An exhibition of his notebooks and designs in London with a video of the creation of the perspective required for “The Last Supper” in Milan; a visit to “The Last Supper” one rainy Tuesday afternoon (before such things as queues and advance bookings), and since; a stunning exhibition of his works of art and inventions in Brussels in 2007 (on the way to a Trade Show); a Listener’s Library audio-tape of his life as “The First Scientist”. So it was with a feeling of familiarity and pleasure that we greeted the introduction of the Leonardo da Vinci Collection by Savinelli. A tribute in Prestige Pipes to the art of this unique and multi-talented genius. and on the embossed Silver foot of the accompanying tamper. “Clavi Viola “– a form of Harpsichord and "Uomo Vitruviano"
In 1881 Lilienthal invented the first hang glider. 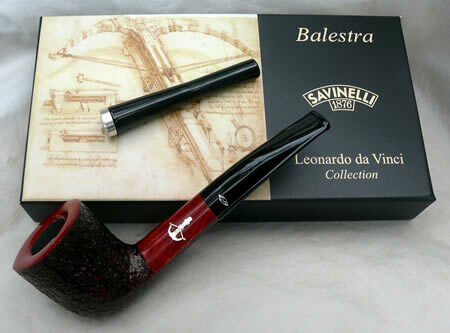 Turn the pipe upside down and the bowl resembles the hot air balloon which Leonardo possibly had in mind. A billiard bowl in a smooth burgundy-coloured finish, elevated above the mundane by the elegant and unusual half-bent, squared-off stem. – would “rounded, bent Dublin” describe it?